Over one hundred and thirty poems from all over the world were submitted to the Pollinator Poetry contest in June 2016. A jury decided on the ten winning poems. The chosen ten then appeared in the specially made Poetry Post throughout Kelowna from the fall of 2016 to the spring of 2017. 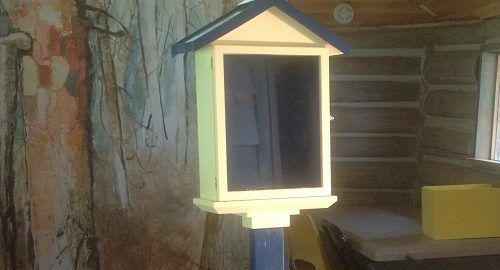 Poetry Posts or “poetry boxes” are “little free libraries” that contain poems instead of books. The Pollinator Poetry Post appeared at the Kelowna Art Gallery, the Laurel Packinghouse museum, the EECO Centre, the Kelowna Farmer’s Market, Seedy Saturday and at many events of Border Free Bees, including the Pollinator Picnic at Summerhill Organic Winery. The Poetry Post is now in Richmond BC! The original poetry came from contributors throughout Canada, the United States and the U.K. Poets responded with passion, beauty, humour and sadness to the topic of pollinators, our relationship to wild pollinators as well as honey bees and the plight of pollinators in the world. The winners received $50 (Cdn) each. Judges for the contest were poets Nancy Holmes and Fionncara MacEoin, artist/ theorist Cameron Cartiere, and pollination scientist Dr. Elizabeth Elle.